Sentiment at Asia’s factories stabilized in March as a rebound in China buoys the region. Japan’s Nikkei and IHS Markit manufacturing purchasing managers’ index for March rose to 49.2 from 48.9 in February, helped by a lift in new orders. South Korea’s PMI rose to 48.8 from 47.2 in the previous month. Still, both readings remain below 50, signaling contraction. China’s official PMI, released Sunday, rebounded to 50.5 from 49.2 in the prior month -- the biggest increase since 2012. A separate private PMI gauge published by Caixin Media and IHS Markit on Monday rose to 50.8 from 49.9 in February. That improvement is lifting the rest of Asia too, said Hak Bin Chua, an economist at Maybank Kim Eng Research Pte in Singapore, underpinned by optimism of a U.S.-China trade deal and plans by China’s government to boost lending and cut taxes to spur demand. 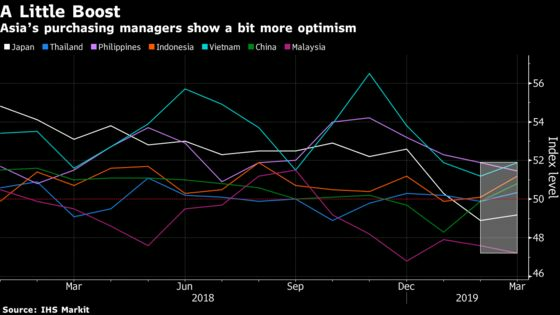 Southeast Asia, where each of the six biggest economies count China as their biggest trading partner, also saw a bit of relief in March after manufacturing sentiment was battered at the start of 2019. Indonesia improved to 51.2 in March from 50.1, Thailand returned to positive territory at 50.3 from 49.9, and Vietnam’s PMI also rose. Malaysia and the Philippines edged lower. A clear upswing across the region in readings for new orders, a gauge of future demand, indicates that demand is improving, said Ben Emons, the managing director of global macro strategy at New York-based Medley Global Advisors. Still, there were grounds for caution elsewhere. Sentiment among Japan’s large manufacturers tumbled by the most in six years. At the same time, South Korea’s exports fell for a fourth straight month in March with shipments down 8.2 percent from a year earlier. Economists also cautioned that the timing of China’s annual new year holiday -- which this year fell in February -- typically distorts the region’s data. “The ongoing slowdown in Chinese demand, which we expect to last through the first half of 2019, is likely to weigh on the rest of the region’s exports and constrain activity in the near-term,” Priyanka Kishore of Oxford Economics wrote in a note. For any pickup in manufacturing to be durable, much depends on how the ongoing trade negotiations between the U.S. and China play out. While both governments have said progress is being made, they have also cautioned that key sticking points remain.